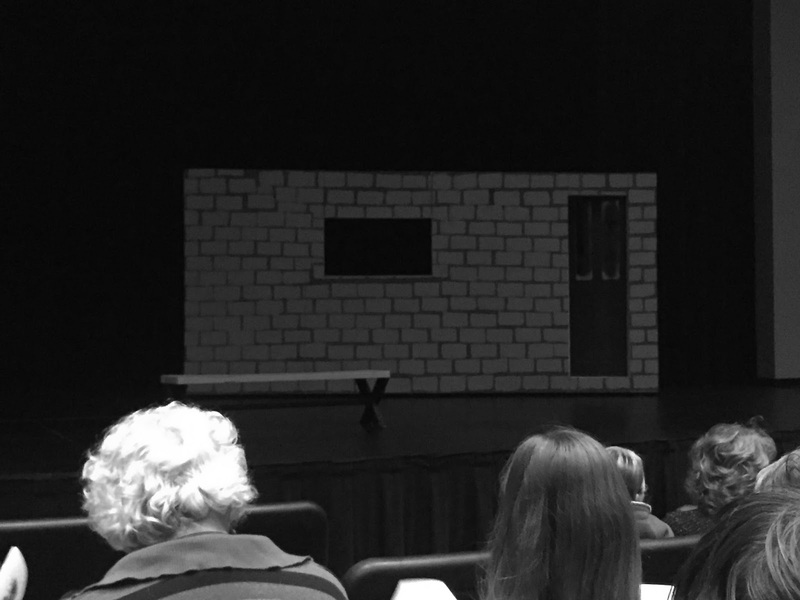 Eryn wanted to go to the Simley High School One Act performance tonight, so we all headed over to check it out. I did one acts in high school and loved them. Way more fun than Three Acts and Musicals generally. More story in less time with more acting (in my opinion). They did two plays. 14 Lines was the angsty sort of play Lars (thankfully) would never allow us to put on when I was in theater. We did humor (Fifteen Minute Hamlet) and drama (Job), but not teen focused angst. Partially because there was a student in our competition area who wrote plays for his school based on teen drug problems and other issues. Angst was thoroughly covered. 14 Lines was about students (and one in particular, a teen mom in Catholic school who gave her kid up for adoption) attempting to memorize Shakespeare Sonnets to present as a final assignment for a nun instructor. There was a kid who was worried his dad would hurt him. A valedictorian who dressed up for her lines. A Pinky Tuscadero type. And a genuinely dumb kid. The main character helps the kid with dad issues get a second chance to nail his lines, but almost misses her chance. But then, in a bit of pathetic fallacy, she shows the nun during a rain storm she's got it down pat. The actors did a fine job, particularly as it was the non-competitive play, but injecting half a dozen 14 lines pieces from sonnets into a play gets slooooow. I don't have a photo from The Internet is Distract...Oh, Look, A Kitten, which is too bad. I wanted a picture of the kid playing the personification of Facebook. He was hilarious. And downright creepy trying to get the main character to look at kid photos and deal with friends who posted about their relationship while misusing literally. I enjoyed the heartbroken teen who said Robert Smith of the Cure said Boys Don't Cry. Well, today, they do. There were personifications of Amazon, Google, Wikipedia, Cat Videos, Click Bait, Angry Birds (but as "knock grandma off her rocker" with exploding pigs), Facebook, and more. A few jokes were flat, but overall it was very funny and very well acted. Some seasoned teen actors in the competitive play and fun to watch.